The weekend has finally arrived and we are so excited! I may be staying at home this year to take care of Dessa, but I still love Fridays every bit as much as I did when I was working outside the home. Weekends mean more rest, family time, and an extra set of hands around the house to help me keep up Dessa. In the spirit of the weekend and all the fun it holds, we decided to try sharing a new kind of content with you. 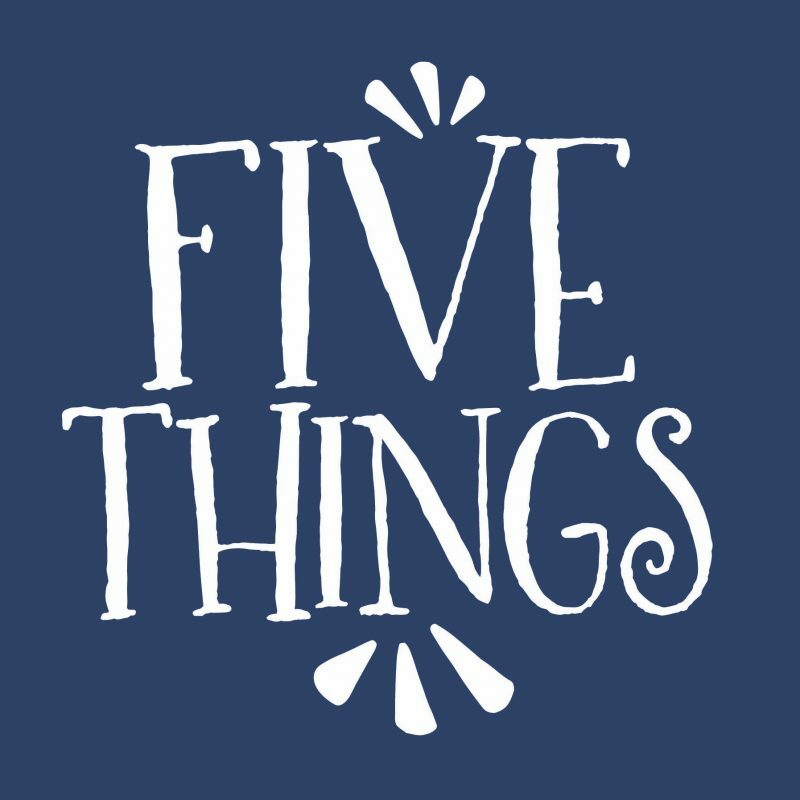 Welcome to Five Things: a new segment we are considering for the blog where we share five stories from our lives. 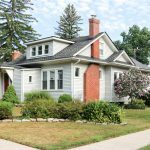 None of the topics would be substantial enough for an entire blog post, but it's our chance to share a little more about our personal life at home with you. I'm excited to share something new with you and can't wait to hear what you think! We hit a big milestone in the Gavin house this week: Dessa was cleared of her sesame allergy! We learned about the allergy this summer when her face broke out after eating a few bites of hummus. A skin test at the allergist confirmed our suspicion: Dessa was allergic to sesame. 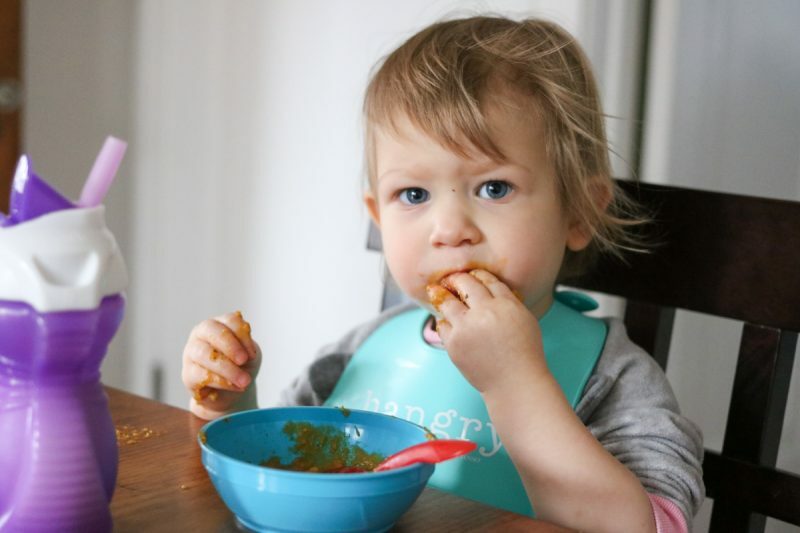 Fast forward our follow-up appointment in December, where Dessa's skin tested negative for a sesame allergy and a negative blood test confirmed the finding. At that point, I really thought it was the end. 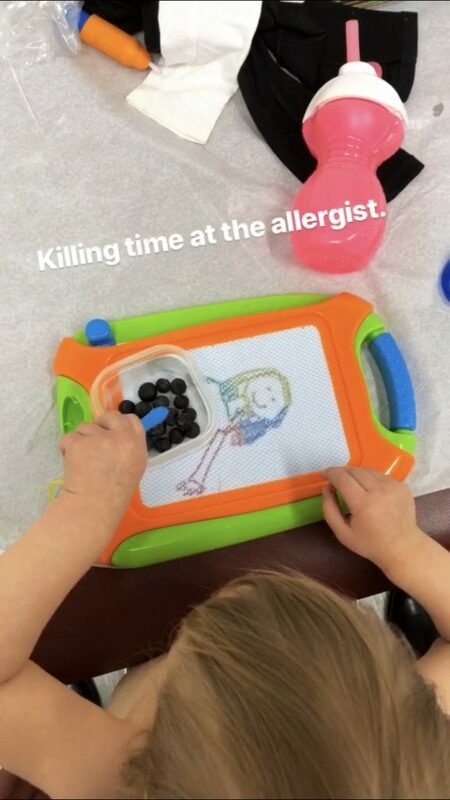 I really, really hate the allergist and was so glad to finally close the door on that chapter of Dessa's life, but the doctor had one last test in store for us. They wanted Dessa to come into the office so they could observe her eating sesame to make sure she didn't have any reactions. I was instructed to bring food containing sesame with me and to plan to be at the office for a couple of hours. We showed up at the allergist and I was so excited for a visit that wouldn't involve any pokes or scratches for Dessa. I brought along a container of hummus and we began the painstakingly slow process of introducing sesame. I gave her the tiniest bite (more of a lick really) and waited 10 minutes for the doctor to observe her. Then she got a bigger bite, we waited again, and then fed her more. It took two hours to get through all those little bites and by the end of the two hours, Dessa was done. She was tired of being cooped up in the little office and just wanted to go play. I brought along a few toys and some extra snacks, but they weren't cutting it. I'm pretty sure my jaw hit the floor when the doctor came in to announce that we would be giving her a big serving of hummus (4 to 6 teaspoons) and then waiting another hour for a final observation. An hour! Trapped in a very small exam room that we had already exhausted every form of entertainment the room could possibly provide. I gave the doctor a fake smile and nodded in agreement and thought “what the heck am I going to do for the next hour?” I fed Dessa the rest of the hummus and started the long waiting game. We face-timed a few people and then Dessa had an all-out meltdown with about 40 minutes to go. I tried really hard to keep her happy, quiet, and contained inside the tiny exam room; but at that point, it was impossible to maintain all three of those conditions. I figured the office staff and other patients would be far more bothered by her screaming than her presence in the office, so I let her out of the room to explore the limited hallways of the allergist office. This proved to be my saving grace. Dessa's mood instantly improved as she happily wandered up, down, and around the office hallways. I felt a little bad because she was underfoot, but nobody asked us to return to the room and the nurses loved fawning over Dessa. That final hour of observation finally passed and we went home after a quick pow-wow with the doctor. Dessa didn't have any reactions while we were at the office, but I was instructed to keep my eyes open for a delayed reaction over the next 24 hours. After that, we could begin to incorporate sesame into Dessa's regular diet. Twenty-four hours came and went without any reactions, so I'm going to go ahead and wave goodbye to that sesame allergy! Woo-hoo! If you follow along with our adventures on Instagram Stories, you may know that Dessa is currently dairy-free. She doesn't have a dairy allergy, it's just a sensitivity. We have a very long and complicated history of dairy in and out of Dessa's diet. We plan to keep Dessa dairy-free for the next few months and see where it takes us. For now, though, we're really, really happy that we don't have to worry about sesame anymore. Just when we think we've got the whole budget thing nailed down, life goes and throws us a curve ball. 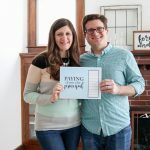 We've been budgeting together ever since we were engaged and we've got it down to a pretty smooth system. Rob always takes the wheel and prepares our spreadsheet ahead of time. When we sat down to work on our January budget a few weeks ago, we were excited to factor in a recent pay bump from Rob's work. It wasn't a huge bump, but any extra cash in the budget is always nice. As we were drafting the budget, it felt like we had so much extra money to work with. We kept going back through all of our categories and adding just a little more spending to each area. Things got a little complicated (and more than a little disappointing) earlier this week when Rob realized an accounting error in our spreadsheet. You see, his law firm just switched from weekly paychecks to bi-weekly. 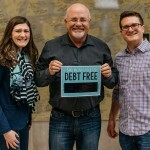 This really shouldn't have been a big deal, but the timing of the transition meant that we had accidentally over-calculated our income for the month – and it was a $1,000 accounting error. We went from having more money than we were used to in the budget to cutting way back to get us through the transition. 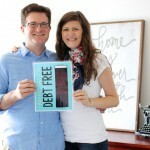 I still don't really understand how it happened (even though Rob has walked me through the hiccup on two different occasions) but I can tell you that it was a one-time problem and we will be able to loosen up the finances a little more than usual starting next month. Rob and I recently started tuning in to our a new online streaming service: FORMED. It's a Catholic video and audio streaming service that we actually heard about two years ago in the bulletin of a local Catholic church we visited for Sunday Mass, but never actually checked it out. Rob and I been looking for a new way to work on our faith formation and decided to finally give FORMED a try, using the login information we had saved from the bulletin. 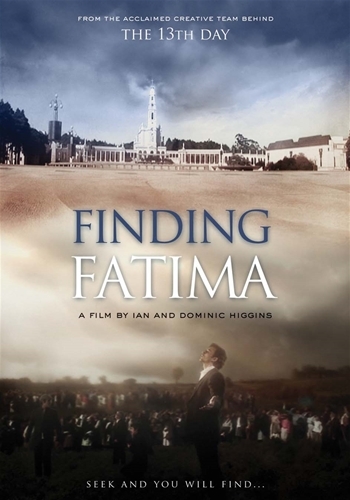 The first movie that we selected from the video library is a documentary called “Finding Fatima” from Ignatius Press. Each morning this week we've been logging in to watch about 10 minutes of the film in bed before we start our day and we've both really been enjoying it. I remember learning a little bit about Our Lady of Fatima in 8th grade, but that was a very long time ago and the details were incredibly foggy. The documentary is very well done and we've already decided that we are going to watch another film on FORMED as soon as we finish “Finding Fatima”. If you're a Catholic mommy or teacher, you might be excited to know that FORMED has the entire Brother Francis video series available in their streaming library. It's the only Catholic animated series that I have seen and I loved showing those videos in the classroom. Just in case you're curious, you can sign up for a free trial of FORMED, purchase a subscription for $10 a month, or see if your church would be willing to purchase a group membership for parishioners to enjoy. The online content library seems to be quite extensive and we are excited to explore more of the available content. Like everyone else in the world right now, I'm on a mission to turn around some of my bad habits and eat better. I formed too many bad habits last year while I was dealing with the stress of juggling too many things, and I became best friends with the McDonald's drive-thru because it was fast and convenient. I also gained about 12 pounds and somehow managed to look like I've gotten pregnant again. I'm not pregnant, but there's no doubt in my mind that friends and family wonder if I secretly am pregnant when they see me because when I gain weight, it always goes right to my belly. Sorry everyone, it really is a food baby. Anyways, I've been frustrated about the weight for a while and actually decided to do something about it right after Thanksgiving. We were in the midst of the holidays, so I'll admit that I didn't change much. I made a few healthier choices when we weren't having a holiday celebration, but the biggest change was that I started drinking a lot more water. I'm embarrassed to admit that I was lucky if I drank 24 oz of water a day before I started my little mission. Now, I make myself drink a glass of water each time I go to refill my coffee cup or reheat a cup of coffee that has gone cold. I get so caught in my household tasks that I'm the world's slowest coffee drinker at home and I usually drink 60 oz of water by noon these days thanks to my new routine. It's been a huge change for the better. And somehow I lost about 2 pounds between Thanksgiving and Christmas. I know it's not much, but anytime the scale moves down during the holidays is a miracle. Once the holidays finally passed, I started paying more attention to the foods I ate. I considered doing another round of the Whole30, but I didn't really want to take away any of my favorite foods, I just wanted to eat better. And that's just what I've been doing. I've basically been taking a cue from my diet when I had gestational diabetes; which means more veggies, leaner meats, and fewer carbs. I've also replaced my nightly glass of wine with a hot cup of tea and only allow myself to have alcohol once or twice a week. The most challenging part has been cutting back on my cheese consumption. I was allowed to eat as much cheese as I wanted when I was diabetic, but I know it's not actually healthy to consume half a brick of cheese in one sitting. I've never been the type of person who enjoys cooking. I cook because I need to eat and home cooked meals are better quality (and often better for you) than eating out. Likewise, I don't own an extensive cookbook collection or go surfing Pinterest in search of great new recipes. Cooking serves a function for me, it does not bring me joy and I definitely don't feel any desire to spend my precious time or energy searching for new things to cook. Apparently, I was really digging the sweet potatoes this week because I also tried out a new recipe for a sweet potato bake with kale, sausage, and white cheese sauce. Oh my word, that recipe was AMAZING. The cheese sauce was definitely unhealthy, but it also had kale so I'm sure it all balances out, right? And there you have it … five things of the latest happenings from the Gavin Family. It's been fun to catch up, but you'll have to excuse me while I help Rob try to conquer our overly ambitious weekend to-do list. Happy Saturday everyone! Thank you for the feedback, it is super-helpful! Coincidentally, I also came up and tried that Turkey Taco Quinoa dish and we also loved it. Here’s to a healthier January! Hi Hope and thank you so much for your sweet words! UGH, the allergist. It really is the worst thing ever with a baby or a toddler. The poke/scratch is bad enough on it’s own, but we always had to hold her still (sometimes making her lay on her belly for 15 minutes or more so the scratches didn’t cross-contaminate). She hated being held in one position so, so much and I’m hoping we don’t have to revisit those tests for a long, long time. Thank you for this new segment! I always enjoy getting little updates about you and your family. Thank you for sharing your life with all of us. Thanks for talking about Formed! I’ve been contemplating getting the monthly subscription for myself, but haven’t done it yet. Do you know, by chance, what the cost difference is if your parish gets the group membership?